Semiconductor giant Intel is said to be in talks with Altera, a specialist in the FPGA (field-programmable gate array) market for a potential outright buyout worth more than $10 billion (about £6.8 billion, AU$13 billion). That would dwarf its previous big acquisition, that of security firm McAfee back in 2010. Wall Street appeared to be pleased by the prospect of this transaction, sending Intel's shares up by 6% at one point. Intel's hegemony on microprocessors is currently being challenged by ARM in the embedded and mobile markets. However, Altera is likely to be used at the opposite end of the CPU spectrum, within the entrails of data centres. 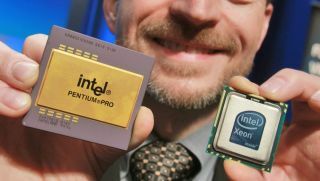 Intel used it already in a range of semi-customised Xeon processors that have been employed widely across a range of selected customers. So what's the deal with FPGA technology then? It essentially allows hardware manufacturers (Oracle, Huawei, Cisco) and hyperscale customers (Baidu, Amazon, Microsoft) to fine-tune/tweak/hack the processor to fit their workload. It can be done very quickly and most importantly, without human intervention. It's essentially a middle-ground between ARM's laissez-faire and Intel's regimented approach to who controls the CPU. Speaking of ARM, Altera, like Intel, is a licensee of the Cambridge-based fabless company. Intel vs AMD, who has the best processor?